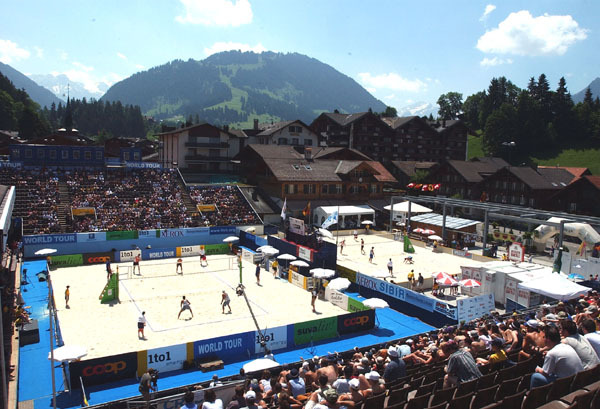 GSTAAD 2005 - Much to the surprise of many cynics and pleasure of Beach Volleyball fans, the summer slopes of Gstaad in the Swiss Alps will host a SWATCH-FIVB World Tour event for the sixth-straight year. Thousands of fans are expected to turn out to cheer on the top men�s women�s players at the 1to1 Energy Open. When the summer months arrive to Gstaad, scenes of endless blue skies, beautiful flowering meadows and strong sunshine are expected in a region where they say there are more cows than people! There is a friendly atmosphere among the mountain folk where Beach Volleyball fans are treated to fine restaurants, bars and shops. The central village of Gstaad is a traffic free zone is traffic free featuring the Castle Oberhofen am Thunersee that houses a Turkish smoking room and a collection of Bernese related objects. The William Tell open-air theatre features a yearly performance of J.C. Friedrich Von Schiller�s drama of the same name. Women � The sixth Gstaad stop for the women�s SWATCH-FIVB World Tour should be interesting to see if a third different team can win the gold medal in the Swiss Alps. Only two teams (Shelda Bede/Adriana Behar and Misty May/Kerri Walsh) have won Gstaad gold medals. Brazil (seven medals) and the United States (seven) have dominated the Gstaad medal picture with Australia being the only other country to gain a spot on the podium as Sydney 2000 Olympic champions Natalie Cook and Kerri Pottharst earned a bronze medal in 2002. The best finish by a Swiss team in those five events were ninths in 2002 and 2003 Simone Kuhn and Nicole Schnyder. Bronze Medal match - McPeak/Youngs won by forfeit over Ana Paula Connelly/Sandra Pires, Brazil. 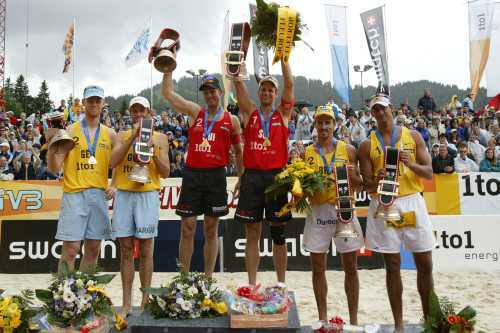 Men � The 2004 Gstaad men�s SWATCH-FIVB World Tour final featured the first All-European gold medal match since 1994 as Athens Olympic Bronze Patrick Heuscher and Stefan Kobel delighted the home crowd by defeating Markus Dieckmann and Jonas Reckermann of Germany in the title match. Each men�s Gstaad winner has come from a different country as the United States, Argentina and Brazil won the first three Alps titles. Bronze Medal match - Emanuel/Ricardo def. Marcio Araujo/Benjamin Insfran, Brazil, 21-18, 21-16 (41).